Transient synovitis of the hip (TSH), a self-limited unilateral disease of unknown etiology, is the most common disorder causing a limp in children. TSH is most common between the ages of 2 and 10 years (average 6 years) and occurs more frequently in boys. The condition often parallels or follows a viral upper respiratory infection and has been considered by some to represent a viral or perhaps "viral-immune response" disorder affecting the hip.18 The few biopsies reported for this benign, transitory disease have revealed only nonspecific inflammatory congestion and hypertrophy of the synovial membrane. Children with TSH present with an ill-defined limp, hip or knee pain, and possibly a low-grade fever. The hip is often held flexed, abducted, and externally rotated to provide for maximum joint volume. A complete blood count may show mild leukocytosis without a left shift. The erythrocyte sedimentation rate (ESR) may be elevated, exceeding 20 mm/hour in nearly one third of patients.19 Radiographs may show capsular swelling characterized by increased distance between the medial acetabulum and the ossified part of the femoral head (Fig. 7.5). Ultrasound examination has been used increasingly as a diagnostic tool to detect hip disorders because of its high sensitivity for demonstrating effusion in the hip joint. Fig. 7.5. 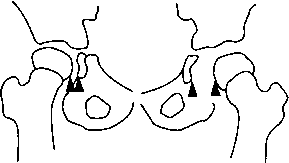 Teardrop distance is the interval between the ossified part of the femoral head or neck and the acetabulum (arrowheads). The teardrop distance is a useful criterion for early diagnosis of Legg-Calve-Perthes disease and is also a good indicator of the presence of excess joint fluid caused by sepsis. In 96% of normal subjects the teardrop distance in both hips is the same or differs by only 1 mm or less. It may be difficult to differentiate TSH from early septic arthritis; and if clinical suspicion is high, the hip should be aspirated. Initial treatment is bed rest, usually at home, but occasionally hospitalization is required to perform studies needed to rule out sepsis and thus allay parental and physician concern. 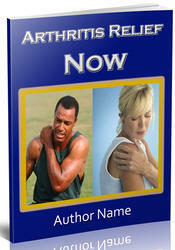 Symptoms may last up to 7 to 10 days but rarely more than 2 weeks. Failure to resolve with rest should lead to a more extensive workup to exclude juvenile rheumatoid arthritis, sacroiliac joint infection, osteomyelitis of the ileum, and osteoid osteoma, each of which may mimic TSH. A few patients with TSH (1-3%) go on to develop Legg-Calve-Perthes disease within a year.20 Therefore, patients with TSH should have their hips examined once or twice during the year following acute presentation. Radiographs are unnecessary if hip motion is full. (skin or subcutaneous abscess, otitis media, pharyngitis, pneumonia, or umbilical infection). In neonates nosocomial infection may occur via catheters or venipuncture. In neonates and infants, the early stages of septic hip may be mistaken for cellulitis, venous thrombosis, superficial abscess, and sciatic nerve palsy. Unilateral swelling of the thigh or leg may indicate a ruptured septic hip with extravasation of pus into the thigh fascial planes. Older children usually present as apprehensive, toxic, and experiencing constant hip pain. Typical septic arthritis of the hip in infants and children can be recognized without difficulty. The child is febrile with the thigh in a position of flexion, abduction, and external rotation. The pain is worse with any hip movement. A site of infection and portal of entry into the bloodstream such as skin abscess, otitis media, or pneumonia is usually present. Laboratory testing may show an elevated complete blood count (CBC), ESR, and C-reactive protein. C-reactive protein rises within 6 to 8 hours, while the ESR may not rise for 24 to 48 hours. There is considerable overlap between TSH and septic arthritis. No combination of physical exam or laboratory findings is 100% sensitive or specific in diagnosing septic arthritis of the hip.19 Aspirating pus from the hip joint remains critical for diagnosis and early decompression. Blood cultures and cultures from other sites are obtained before initiating antibiotics (see Reference 51, Chapter 43). Staphylococcus and gram-negative organisms are commonly found in newborns. In children 1 to 18 months of age, Haemophilus influenzae is a frequent cause of septic hip. Salmonella can infect a hip in patients with sickle cell disease. Intravenous antibiotics should be started following needle aspiration and culture, but antibiotics alone cannot cure septic hip. Treatment must include surgical decompression. Slipped capital femoral epiphysis (SCFE) is the most common serious disorder of the hip in adolescents. The peak age incidence is 11 years for girls and 14 years for boys; the incidence in the general population is approximately 2 per 100,000 with a male to female ratio of 2.5:1.0.21 SCFE is characterized by sudden or gradual medial displacement of the femoral neck from the capital femoral epiphysis. The epiphysis remains in the acetabulum, resulting in a retroversion deformity of the femoral neck. The goals of treatment for a patient with a SCFE are to stabilize the slip and prevent further displacement while avoiding the complications of avascular necrosis, chondrolysis, and early osteoarthritis. With an acute slip, mild symptoms are present for a short time before the displacement occurs; minimal trauma may then cause an acute separation, with pain so severe the child cannot bear weight on the affected side. Patients with the chronic form have hip pain localized to the groin, buttock, or lateral hip. Occasionally, the child has only knee pain. There is a decrease in abduction, flexion, and internal rotation, and as the hip is gently flexed it may roll into external rotation. Surgery is the only reliable treatment for SCFE. Results are best if it is performed soon after diagnosis because outcomes depend on early stabilization. Any attempt to reduce a chronic slip produces avascular necrosis. In children who have unilateral disease at diagnosis, nearly 20% may go on to develop bilateral disease. Most often sequential slips will occur within 18 months, although reports have documented cases that occur up to 5 years after initial diagnosis.25 Frequent follow-up examination is recommended until definite radiographic evidence of physeal closure is noted. Fig. 7.6. 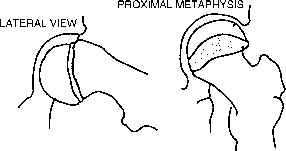 Left slipped capital femoral epiphysis. A line drawn along the superior aspect of the femoral neck (Klein's line) barely intersects with the femoral head compared to the normal right side, a sign of slipping of the left femoral head. Fig. 7.7. Barlow and Ortolani tests. reduction test. A positive test is felt as a "clunk." The high-pitched click that is often heard is normal and unrelated to DDH. Fig. 7.8. 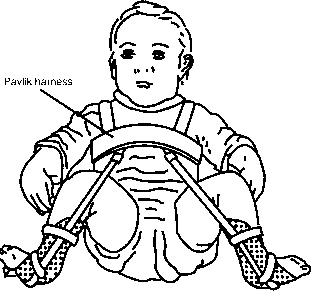 Pavlik harness on a newborn. The hips are fully flexed, then fall out passively into abduction. lize after 2 to 3 months. Dislocated hips diagnosed at 6 to 18 months of age often require closed or open surgical reduction under anesthesia, followed by spica cast immobilization. Catterall34 has classified LCPD according to radiographic findings of the percent of the femoral head that is avascular. The ultimate Catterall classification may not be determined for 6 to 9 months after the initial onset.35 The history and physical findings can vary markedly depending on the stage of the disease process. 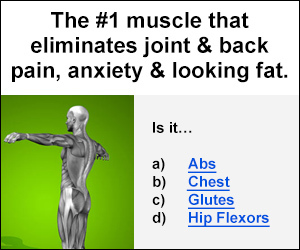 During the early stages, the history is most often that of a limp or increasing groin, thigh, or knee pain. The physical findings at this time are similar to those of a child with an "irritable hip"; the initial synovitis may cause a decrease in range of motion on internal and external rotation, and there may be muscle atrophy of the thigh or calf consistent with an antalgic gait. With later, more severe stages of LCPD, there may be contractures of the adductor and hip flexor musculature in addition to restricted internal and external rotation. Techniques for diagnosing LCPD and determining its prognosis include radiography, technetium scanning, MRI, arthrography, and CT scans. They are all equally useful, and each has advantages and disadvantages. Laboratory evaluation is normal. LCPD is a self-healing disorder and there is no evidence that any treatment speeds the return of blood flow to the femoral head.20 The main treatment objectives are to relieve muscle spasm, regain range of motion, and contain the femoral epiphysis within the acetabulum to minimize deformation of the femoral head. Orthopedic consultation is recommended. Nonsurgical treatment includes the use of a spica cast, removable orthosis, and braces. Surgical options for more severe disease include soft tissue procedures to release the adductors and bony procedures to mechanically realign the hip.36 Long-term outcomes are good for most children, although approximately 10% to 15% develop deteriorating symptoms and degenerative arthritis that may require hip arthroplasty.37 Most patients with LCPD can participate in sports.